MatchPoint franchise consultant expert franchise advice to start your own franchise. Receive expert franchise consulting guidance. Our Free franchise consulting services can guide you through your franchise research process. Want to Start your own Business? Take the Test Today! The MatchPoint philosophy is rooted in the belief that optimal success in Franchising is achieved through matching the RIGHT individuals with the RIGHT Franchise systems. Find the Franchise that is Right for You! You are a just a few steps away from being guided through a process that will help you determine which franchise is right for you. The MatchPoint profiling system is FREE. A MatchPoint Consultant will communicate with you within 24 hours. Start the process now by filling out the registration below, click submit and take the MatchPoint HeatMap profile test. 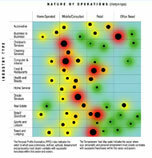 In 2006 the Personal Franchise Assessment Test was created by MatchPoint. MatchPoint developed the MatchPoint™ Personal Franchise Assessment Test after thousands of hours of dedicated research in the Franchise field since 2004. This unique and sophisticated profiling system will help you to narrow the playing field to only those Franchise systems that offer you the best opportunity for success. The Personal Franchise Assessment Test provides MatchPoint Consultants with unique insights into your skills, experience and personality. This insight and knowledge helps the MatchPoint Consultant identify the opportunities that best match your needs. Our Goal at MatchPoint: To Find a "Great Fit" for You. Benefit from our Free Test and no obligation Free franchise consultation services: MatchPoint will help you select the right franchise business for you. If you're ready to get started on your future, just complete the test and one of our industry experts will contact you with your RESULTS within 24 hours. Note: By entering your information you are making a request to take advantage of a FREE consultation with a MatchPoint Franchise Consultant. The consultant will give you a preliminary review of your results and the franchises that are the best possible fit for you. You recognize that in order to receive this FREE offer that your email address AND telephone number must be valid. Yes, I would like to take advantage of the free service provided by MatchPoint. I understand that submitting the following form does not create any obligation. I will be contacted via email or phone to provide additional information about the options and choices available to me. I will not be asked to pay any fee for this service during this process. MatchPoint can help you evaluate and select the right franchise business in the <?xml:namespace prefix = st1 ns = "urn:schemas-microsoft-com:office:smarttags" />United States. While franchise investments vary, you will need a minimum of $20,000 US liquid capital (cash, securities, home-equity) AND a net worth of at least $100,000 US to meet the investment parameters of most franchise companies. Privacy Statement: MatchPoint and its partners do not sell the following information to any party under any circumstances. Get started today! Receive FREE Franchise Consultation Services. To learn more about the MatchPoint franchise consultation services, simply complete the form below.